Viking Books for Young Readers, 9780670014392, 368pp. 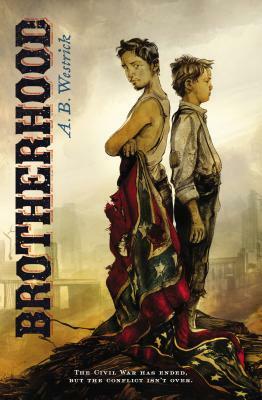 In this powerful and unflinching story of a family caught in the period of Reconstruction, A.B. Westrick provides a glimpse into the enormous social and political upheaval of the time. A.B. Westrick is the daughter of Southerners who sought to leave the South behind. Raised in Pennsylvania, she later moved with her husband to Virginia and spent hours walking Richmond’s brick streets, wondering how her ancestors fared during and after the War Between the States. Brotherhood grew from these wonderings. A.B. Westrick has been a teacher, paralegal, literacy volunteer, administrator, and coach for teams from Odyssey of the Mind to the Reading Olympics. A graduate of Stanford University and Yale Divinity School, she received an MFA in Writing for Children and Young Adults from Vermont College of the Fine Arts in 2011. Brotherhood is her first novel. A.B. Westrick and her family live in Mechanicsville, Virginia. Visit her at www.abwestrick.com.